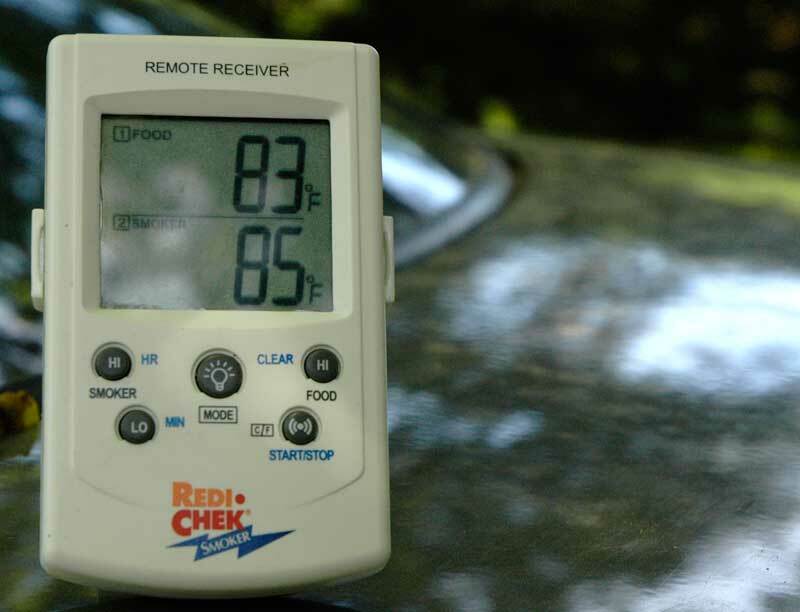 The Maverick ET-73 is one of the few (maybe just 2) remote thermometers on the market that offers alarms for both high and low pit temperatures and high temperature for meat. It uses two probes, one to monitor your pit temperature, and one stuck into your meat to let you know when the meat reaches your set temperature. Here the remote sending unit is pictured hanging from my WSM. The sender and the probes. 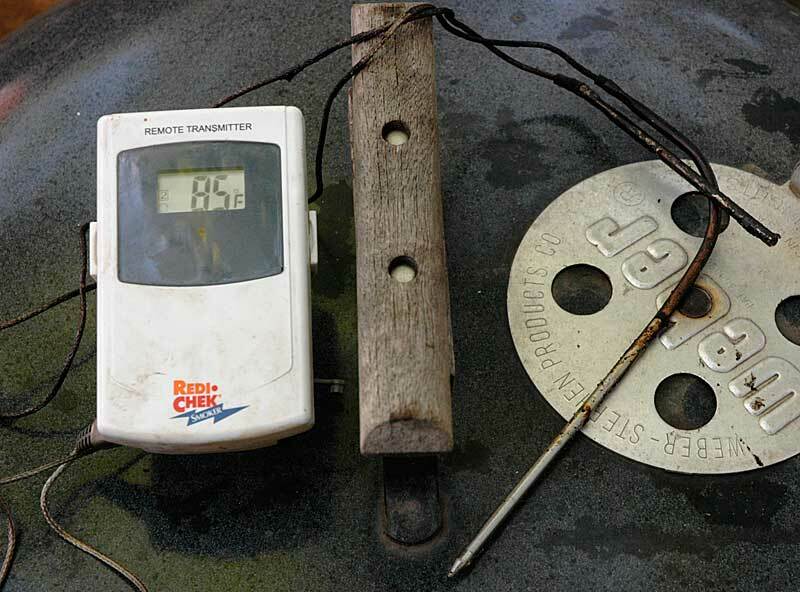 The probes have something of a bad reputation on the internet for easily dying if exposed to temperatures over 400 degrees or if the cable is kinked much (such as by being closed under a lid). The power switch is hid behind the gasketed battery door in an attempt to keep it somewhat water resistant. The receiver for the ET-73. There is a backlight button, and a timer that can count up or down, although strangly stops at 10 hours when counting up. If the unit stops receiving updates from the sender there is no notification, although it generally starts to pick them up again once you move back into range. Overall the ET-73 is a handy unit. I've heard some people compare it to the Thermapen, but for me this fulfills an entirely different role. Here in the midwest it is often either really hot or really cold. There are plenty of days I don't want to be out looking at the smoker every 30 minutes. 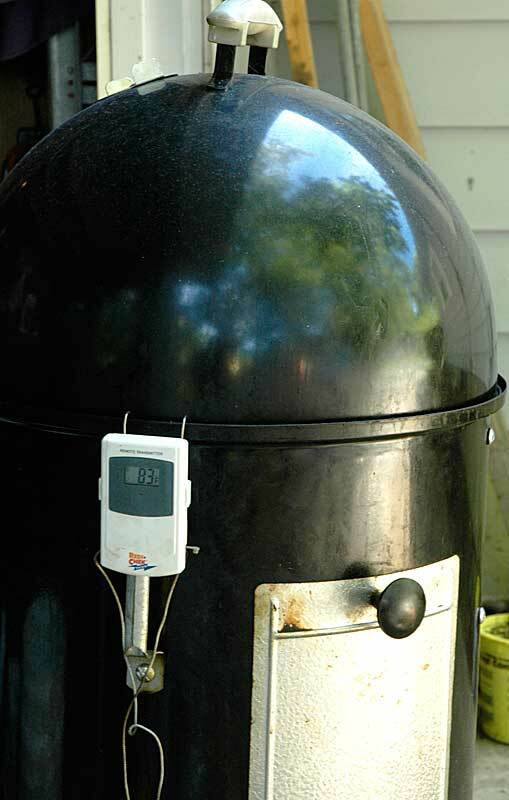 With the ET-73, I can relax comfortably indoors and it will let me know if the smoker runs out of the temperature zone I want it in, or if the meat is nearly done and I should go going out with my Thermapen to keep a closer eye on it. It is also nice for getting some sleep without worrying about if your smoker will go out of control without you knowing about it. It isn't a perfect unit, I'd like to see longer and more durable probe wires by default. The count up timer should count up to 99:99. An alert if it hasn't received a temperature update in a certain period of time would be nice. Being one of the few items that offers as much as it does though, I think the unit's features are worth living with despite the flaws.